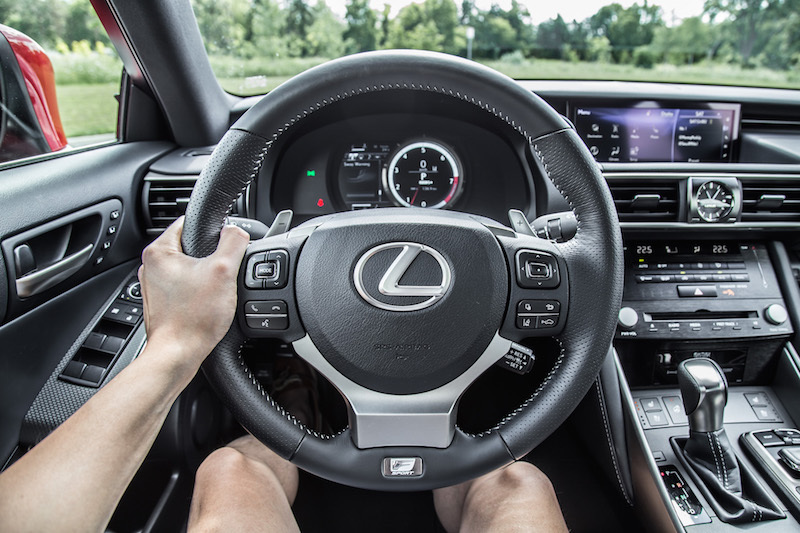 The bread and butter sedan of the Lexus stable, the third-generation IS, has been in showrooms for nearly five years now but still remains as relevant as ever, challenging the kings of sport luxury namely the BMW 3 Series, Mercedes-Benz C-Class, and Audi A4. With ten different configurations available to suit any kind of buyer, the IS portfolio ranges from RWD to AWD setups to four- and six-cylinder engines. Changes for 2018 remain minor after 2017 brought a slight nip and tuck to the sheetmetal adding a tapered front grill and new head- and tail-lights. 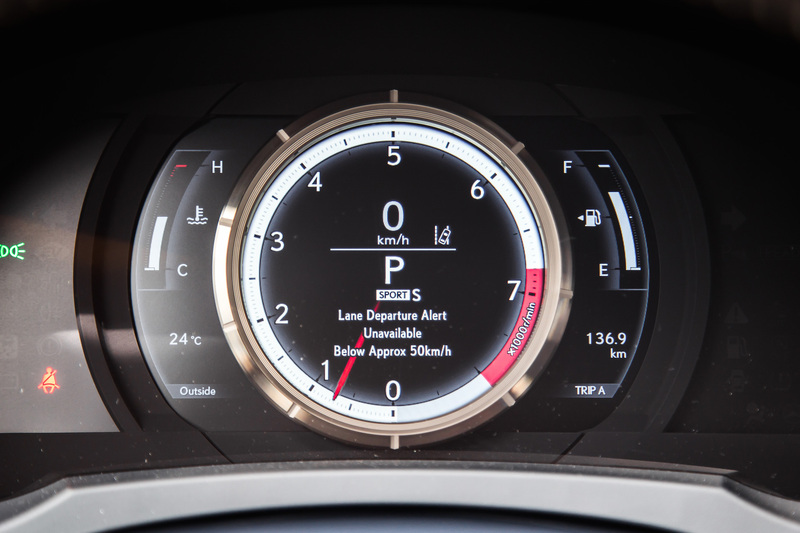 A suite of safety features is now standard for 2018 and include pre-collision warning with pedestrian detection, automatic high beam, auto-levelling headlights, adaptive cruise control, and lane departure warning. 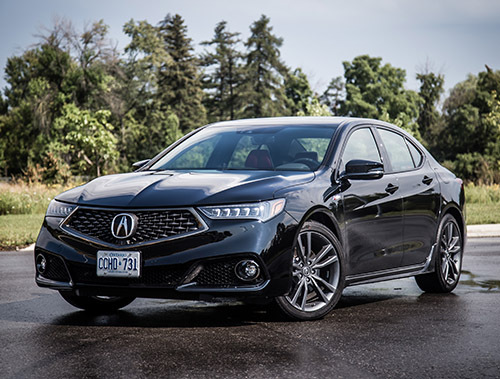 This adds to the already impressive list of standard features like a 10-way adjustable driver’s seat, heated front seats, Bluetooth connectivity, and a rear view camera. 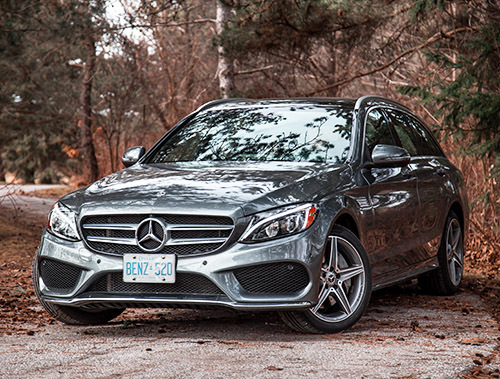 Revisions aside, the IS remains a handsome sedan with the unmistakable spindle grill and haunched up rear end. The lights are sharp, giving off a sophisticated demeanor that has aged fairly well. 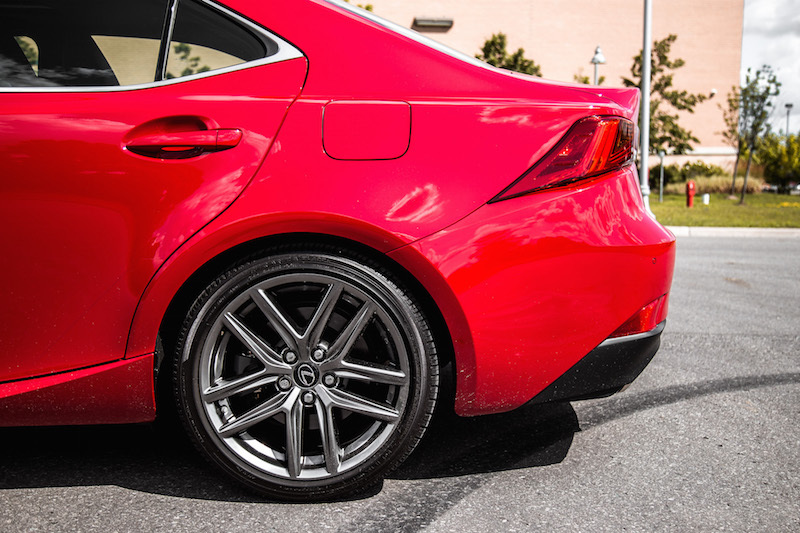 Those 18-inch wheels look the part too, as does the aerodynamic body kit offered by the F-Sport package - in all honesty, have you ever seen an IS without the F Sport Package? Didn’t think so. On the inside, the IS delivers a sweet cabin layout. We first drove this generation of IS back in 2014, and it still appears fresh and attractive today. The center console is button intensive but functional and sports large buttons for the heated wheel and seats. The volume and tuning dials are finished in a matte texture that feels incredibly expensive, but the touch-slider heating controls I can do without. They’re not the easiest to modulate with precision, and is more of a Hail Mary type of control with your fingers crossed that it hits that optimal 20.0 degrees. 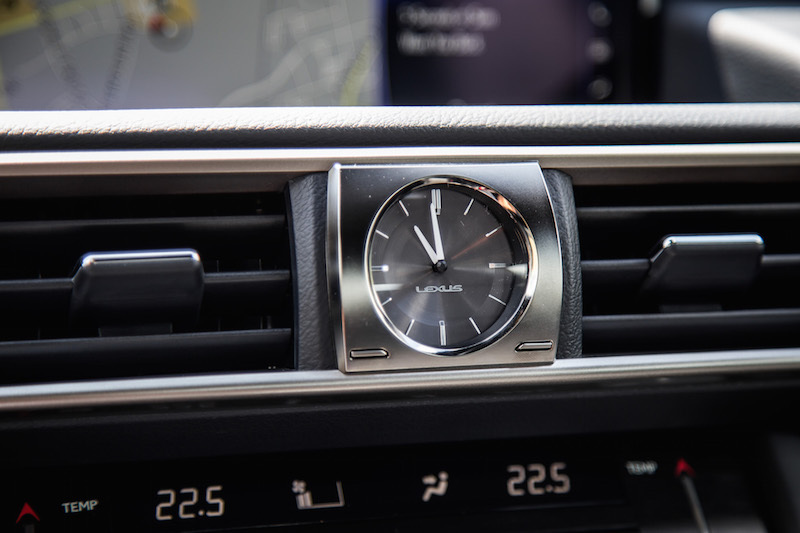 Love the analog clock and the soft leather wrap on the steering wheel, though. 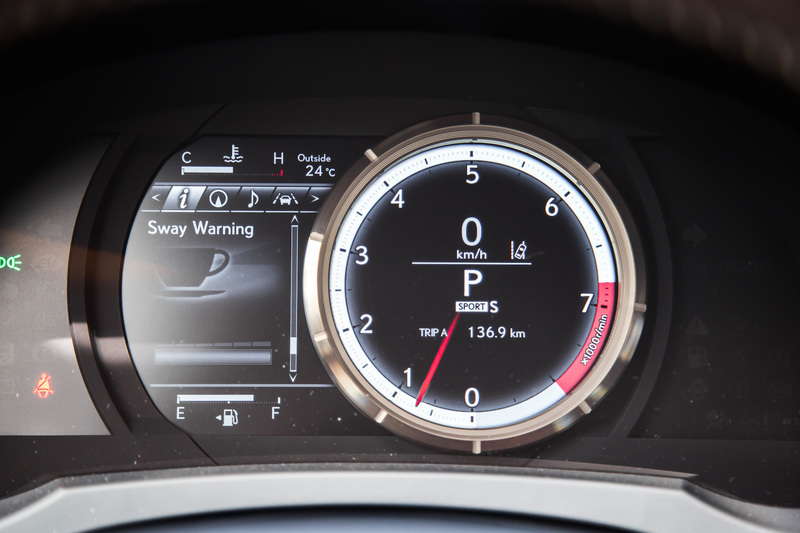 The LFA-inspired center dial in the instrument cluster is slick, and it will slide back and forth and emit a satisfying brrrrrrr noise when doing so. It’s more of a party trick than anything else but given that you will be staring at this dial for the majority of your tenure with the IS, best that it look engaging and sporty. It succeeds in this regard. While I’m on the topic of tech, the 15-speaker Mark Levinson sound system is possibly the best in the segment, trumping BMW’s Harmon Kardons and Audi’s Bang & Olufsens, delivering rich notes, and enough bass to give the windows a proper shaking. Where the IS begins to falls behind its competitors is on cabin space. 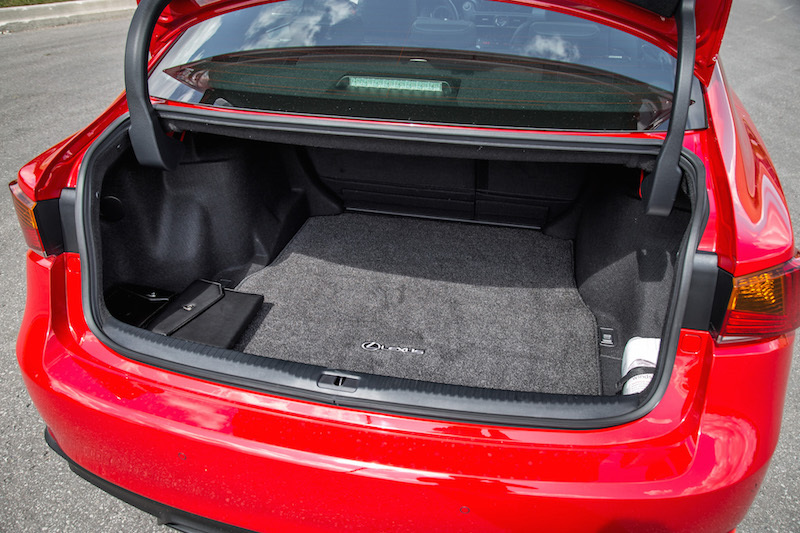 The IS looks and feels snug, and if you’re part of the 90th percentile in height, sitting in the back seats may have you thinking twice about carpooling with any IS owners. Other ergonomic foibles include the heated steering wheel only warming up the 9-and 3-o’clock positions (Lexus’ way of serving justice to those who don’t hold it properly), the gear shifter that gets in the way of pressing the heated seat buttons above it, and the rather horrid infotainment system that still utilizes that way-too-sensitive mouse touchpad. Switch to a touchscreen or proper rotary dial already. 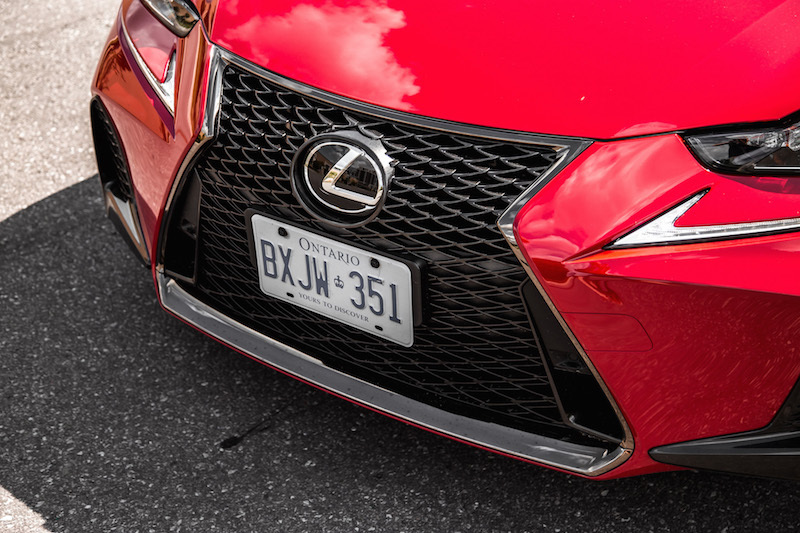 The Lexus IS lineup offers three powertrains, and bare with me because this can get tricky with the ever-changing flurry of automotive jargon. 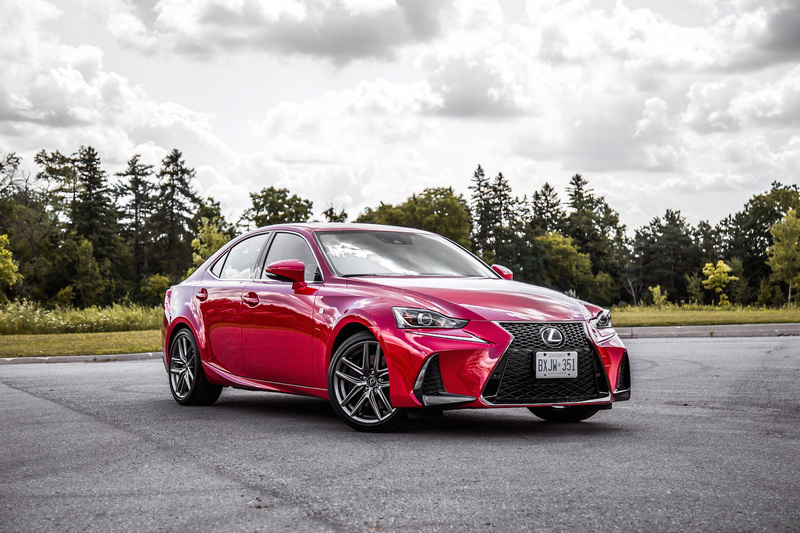 The base model is called the IS 300 RWD ($40,850) and comes with a 2.0L turbo-four punching out 241 hp and 258 lb-ft through an 8-speed automatic - this used to be called the IS 200t. 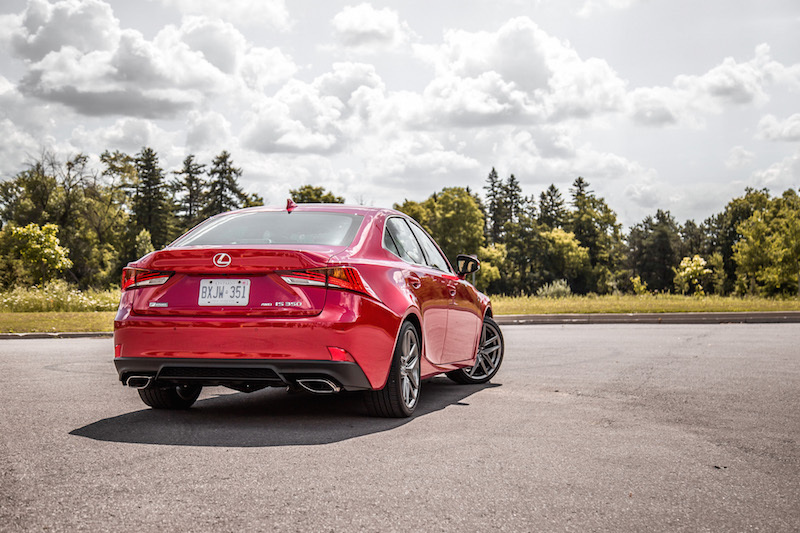 If you want the IS 300 with AWD ($43,400), that will come with a naturally aspirated 3.5L V6 delivering 260 hp and 236 lb-ft through a six-speed automatic. The IS 350 on the other hand only comes in AWD ($52,900), and uses the same 3.5L V6 but is tuned to produce 311 hp and 277 lb-ft through the same six-speed auto. 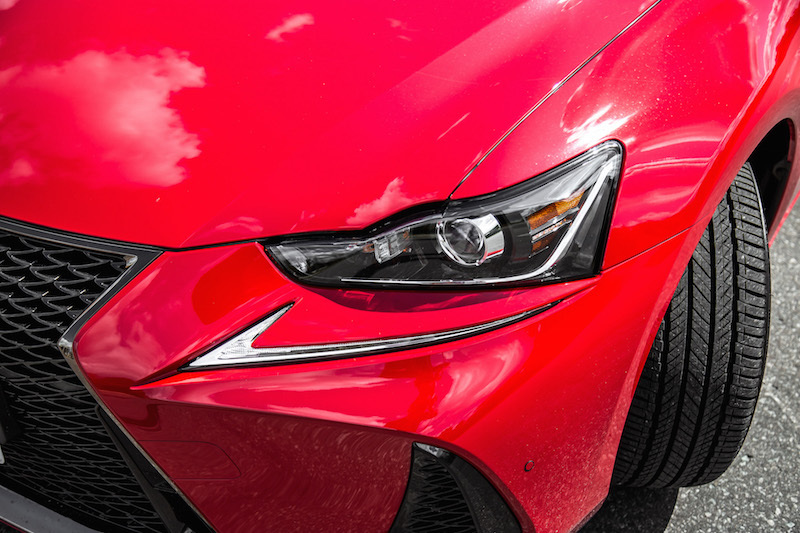 Now that we have that out of the way, we can talk about how it drives, more specifically the IS 350 AWD with the F Sport Series 3 Package that I had the opportunity to spend a week with. Off the bat, it was the V6 that stood out to me the most. Naturally aspirated and without any form of turbo- or superchargers, this six-cylinder is a refreshing reminder of how things used to be. Thrust isn’t abundant in the low revs but the build up to maximum propulsion is linear and progressive. To squeeze out every ounce of juice, you have to exploit the higher revs of the powerband and let the engine howl to its redline. Shift, and repeat. This is in direct comparison to the turbo-infested competition that admittedly, delivers a whopping tidal wave of low-end power, but the murky power delivery with unpredictable boost and horrid turbo lag has me lusting for a free breathing engine instead. 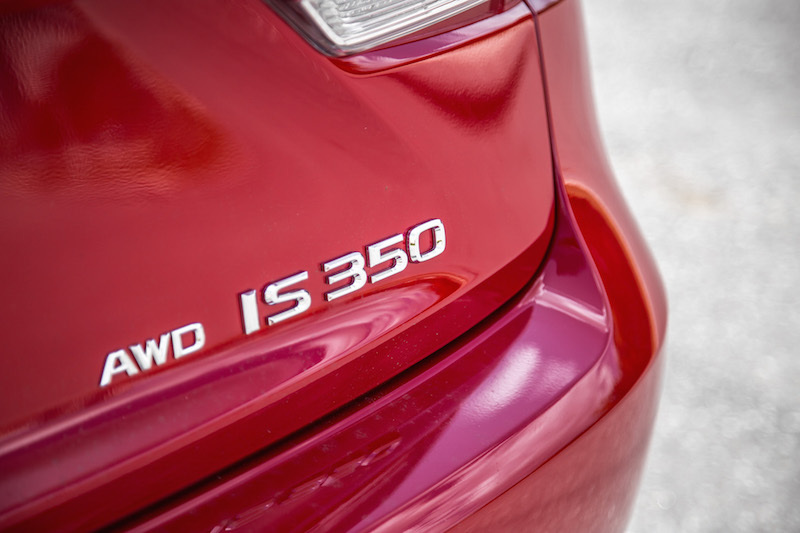 In the IS 350, the V6 punches out 311 hp at 6,400 rpm, with max torque coming rather high in the range at 4,800 rpm. It’s a motor you have to wring out to fully understand and appreciate, and doesn’t hand you oodles of power on a silver platter. Just the way I like it. Every IS with the V6 motor (IS 300 AWD, IS 350 AWD) only comes with the six-speed automatic, and it’s not terribly quick. 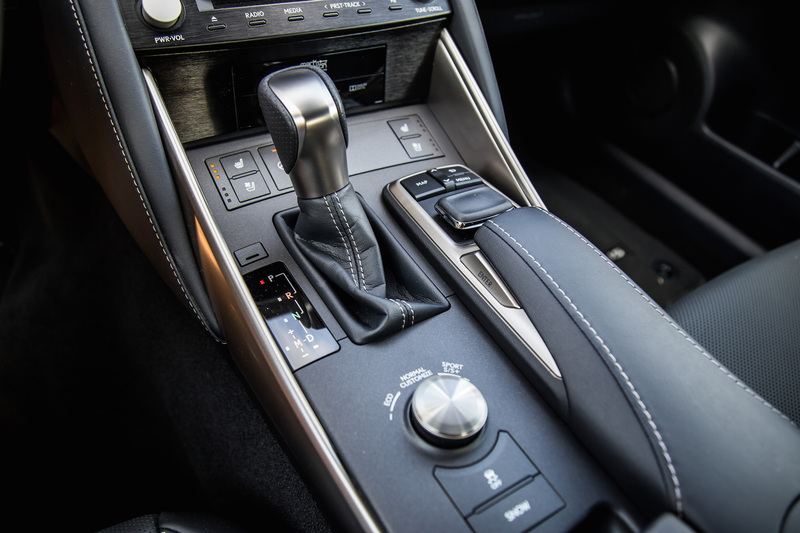 If directly commanding the shifts via the paddles, this gearbox is rather lethargic. 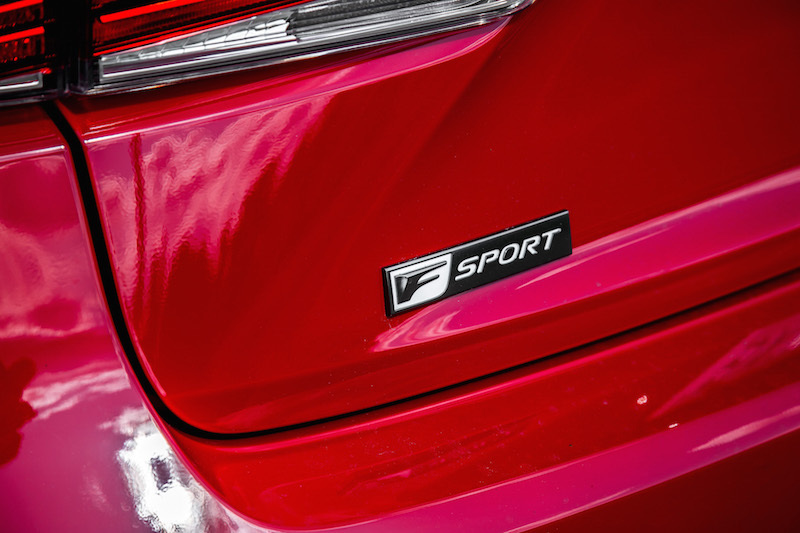 But left to its own devices, the 6-speed is rather effective at keeping the needle in the bulk of the powerband where most of the torque lies, especially when Sport or Sport+ mode is selected. The exhaust also emits a proper grunt, though much of the noise is artificially enhanced through the cabin speakers. It sounds good though, similar to the GS F and RC F but a few octaves lower. Taking the IS 350 through town, I was pleasantly surprised by its excellent body control and supple ride quality. The chassis is composed and the body never jolts or surprises you with unwanted motion. It handles rather well but is clearly suited towards cruising rather than carving. Proving that point is the suspension: coddling yet not taut enough to reduce body roll to an unnoticeable minimum. 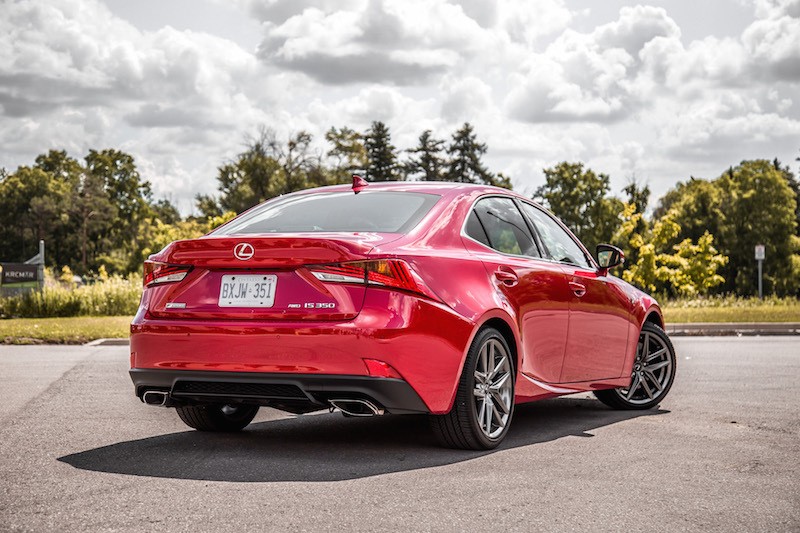 The IS 350 is not as porky as the Acura TLX, but not as comfortable as a C-Class either. The electric power steering is numb as well - at low speeds you won’t feel any change in the terrain via the wheels, but it will faithfully and progressively build up weight when loading up in a corner, giving you some idea of the available grip. Dip deep into the V6 and the IS 350 will reward you with smooth power delivery and enough torque to make the trees blur. 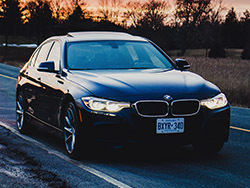 It’s a rather exciting sedan with enough cabin amenities and standard features to keep owners happy for many years to come, but don’t go into your test drive expecting oodles of performance like the more focused BMW 3 Series - that will surely leave you disappointed and wanting for more power and a sharper drive. 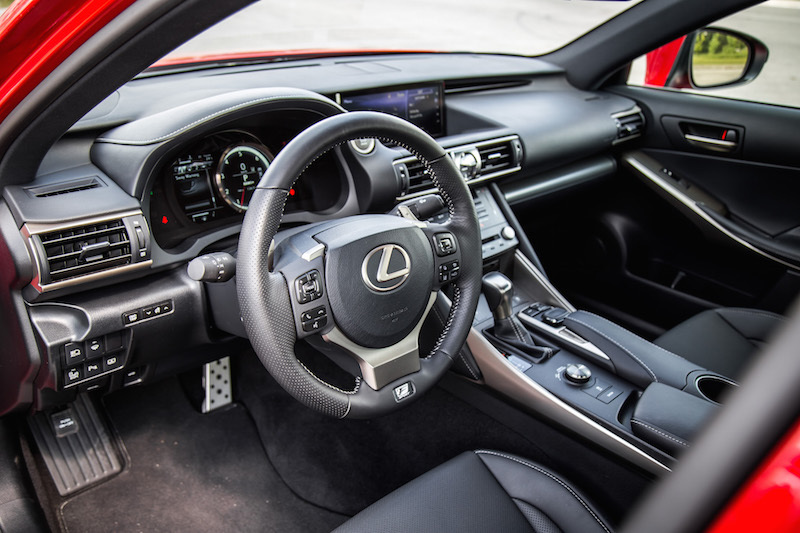 View the IS 350 as a more of a luxury oriented vehicle, one that expertly balances both sport and comfort with a heavier emphasis on the latter in typical Lexus tradition.